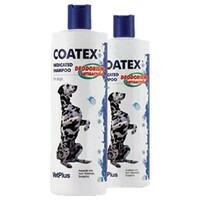 Coatex Medicated Shampoo for Dogs contains chloroxylenol, salicylic acid and sodium thiosulphate to give outstanding skin cleansing. If you have a dog with dermatitis, a poor coat and flaky or greasy skin, no doubt with an unpleasant odour, then this is the shampoo for you. Antibacterial, antifungal, deodorizing and with excellent ability to remove skin scale and crusts.